This 1955-era photo of the "Portaphone" might be considered one of the world's first commercially available portable phones. It cannot be considered to be a cellphone in that there were no "cells" of transceiver stations capable of servicing sets moving between cell coverage boundaries. 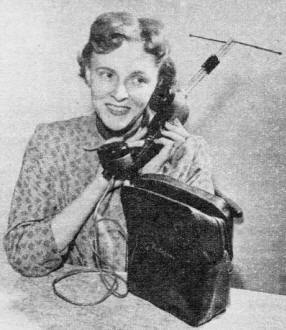 Early portable - or mobile - phones were serviced by a central tower that performed a relay service between the RF device (handset) and the local telephone service. The earliest of those systems, prior to automation, relied on a human operator to patch through calls just like the old panel of (mostly) women that physically connected call lines between both parties. 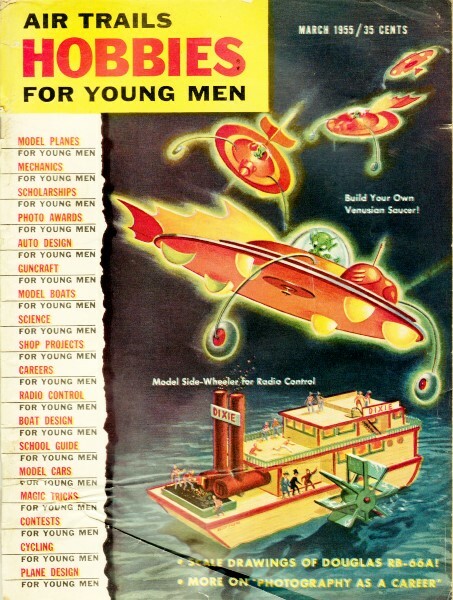 This appeared in the March 1955 issue of Air Trails - Hobbies for Young Men magazine. Portable two-way radio phone for use in homes, office buildings, construction jobs or farms, operating on "citizens band" (lower right photo) designed by A. Fuller Dean of Chicago. Called Portaphone, set has a range of 8 to 12 miles in open spaces, 800 yards within steel buildings. Power supplied by dry cell battery carried in plastic bag.